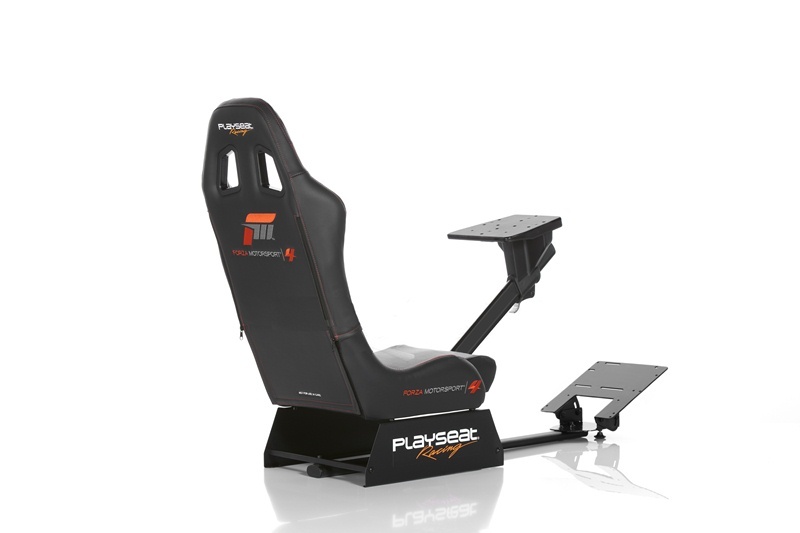 Introducing the Forza 4 licensed Revolution Sim-Racing Seat, the next level of the ultimate gaming experience from Playseat! Consisting of several new modifications not found on the Evolution, this chair provides ultimate comfort with a unique style to boot! Modeled after the dynamic race seat styling featured in real race cars, complete with head stabilizers, the Forza 4 Racing seat is the perfect way to bring the Forza 4 racing experience home! The Playseat Forza 4 edition Revolution Sim-Racing Seat includes extra strong, lightweight, black powder coated tubular steel frame with high-tension spring, and wire system. High profile side bolsters with Ultra high-density foam is fully upholstered in high-quality synthetic leather with official Forza 4 branding. The seat also includes reinforced synthetic leather patches in the high wearing areas. Removable seat back and base cushions, an integrated side head protection system and patented foldable system in the back of the seat for easy and fast storage. Seat chassis and wheel/pedal support framework are manufactured using extra strong, heavyweight, powder coated steel with special steel tubing and aluminum quick release pressure handles for multi-point adjustment of the peripheral support plates to preserve the framework. The Forza 4's Revolution features a newly patented fully adjustable steering wheel support with aluminum quick release handle for easy adjustment of height and length and universal steering wheel support for most PC and console wheel & pedal sets on the market. Also features a fully adjustable foot pedal plate exclusive to the Forza 4 Edition Playseat that allows for full support of Fanatec's CSR and CSR Elite Club Sport Foot Pedal sets and permits adjustable driving angles. Fully supports Playstation2, Playstation3, Xbox, Xbox 360, Wii, and PC wheel/pedal sets. New designed extra strong, powder coated triangle tubing with extra space for putting through all wiring and PU protection between tubes to avoid scratching of the powder coating.